Students who have achieved learning before commencing their studies at American College, whether it is certified learning or informal learning may transfer credits to the program of study they will be attending at American College (i.e. exempted from respective credits), thus reducing the period of study to obtain their qualification. Certified learning is learning for which students have received a formal qualification, for example by studying at a higher education institution, studying towards obtaining a qualification of a national testing program or towards passing an examination of an examination board or professional body. Informal learning is learning achieved outside of a formal learning environment, for example learning gained as part of work experience, volunteer work, or as part of a training course for which students have not received any formal qualifications. Credits may be transferred provided that it is relevant and can be documented. 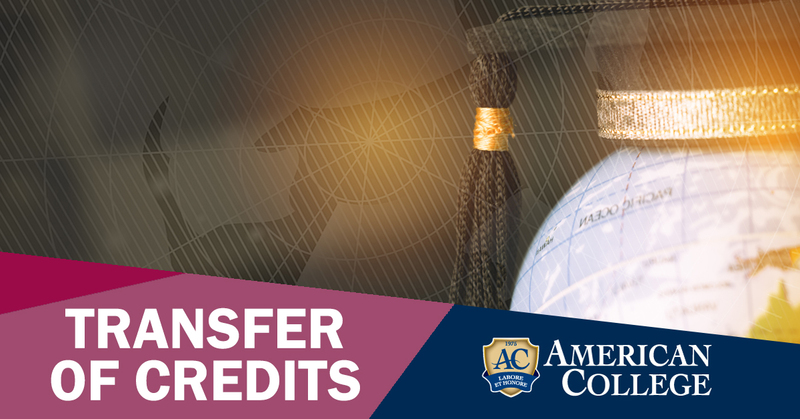 Transfer credits may correspond to specific American College courses or may apply as credits in specific categories (general education credits, business core credits, major credits, etc.). Where the credits duplicate, credits will transfer from only one source. b) a detailed description or syllabus of the course(s) completed. In the case of applying for credits from National Testing Programs, Examination Boards and Professional Bodies, students need to submit the qualification certificate or any other official evidence of the qualification obtained or examination passed. In addition, they need to submit a detailed description or a syllabus related to the qualification obtained or examination passed. In the case of credits from informal learning students need to submit a portfolio documenting that such learning was accomplished. The evaluation of transfer credits official report may be given to a student prior to admission, provided that the student submitted all the above promptly. Students who fail to submit, along with their Application for Admission, an Application to Transfer Credits and the necessary documents (as described above) may do so at the time of registration, but not later than the end of their first semester. Students who decide to apply to transfer credits after they arrive at the College must submit all necessary documents to the Director of Administration. However, students are encouraged to apply to transfer credits prior to their first enrolment in courses to avoid enrolment in courses which they would otherwise receive credits for. Moreover, in some cases, validation of transfer credits may be required in the form of oral or written examinations. American College will also accept formal evaluations by the World Education Service or other authorized evaluation services for work completed at other higher education institutions around the world. Transfer credits appear on the student’s transcript with the grade of “TR”. The number of credits attempted for such courses does not enter into the computation of the Cumulative Grade Point Average. In the case of transfer credits from Erasmus+ student mobility studies transfer credits appear on the student’s transcript with the grade of “P” (Pass). The number of credits attempted for such courses does not enter into the computation of the Cumulative Grade Point Average. In the case of transfer credits by examination, letter grades are given based on the numerical mark achieved in the examination, according to the College grading system and they appear on the student’s transcript. In addition, the number of credits attempted and earned for such courses enters into the computation of the Cumulative Grade Point Average. Students who have transferred credits, regardless of the number of ECTS credits transferred should complete a minimum of 30, 60, 90, 120, 60 ECTS at our College in order to be eligible to obtain a certificate, diploma, higher diploma, bachelor degree or a master degree from American College respectively. Credits earned at accredited higher education institutions (colleges and universities) or in accredited higher education programs of study are transferable to American College. American College may sign articulation agreements for the mutual transfer of credits with other colleges and universities. Students are permitted to transfer credits from distance learning, online learning, web-based learning or correspondence accredited courses offered by colleges and universities. The College awards credits to American College students who study abroad for one or more semesters under the Erasmus+ student mobility program. The courses taken by the student at the host institution are pre-agreed between American College, the host institution and the student. Therefore the courses taken and passed by the student are considered as an integral part of the student’s program of study at American College and full academic recognition is given. This list is not exhaustive and other similar qualifications or examinations passes may be accepted for credits transfer. The College may award credits on the basis of examinations in a number of courses. Students wishing to earn credits by examination must apply in writing to the Director of Administration and must provide evidence that they have covered the syllabus of the particular course or courses. It is possible to earn credits from learning achieved outside of a formal learning environment, for example learning gained as part of work experience, volunteer work, or as part of a training course for which students have not received any formal qualifications. Informal learning is about skills, knowledge and competences acquired through such activities. Credits are given for the learning or achievements accomplished through such informal learning activities rather than the activities themselves. A portfolio must be submitted documenting that such learning was accomplished.